I met Prof. Hüther for the first time two years ago at the Entrepreneurship Summit 2015, annually organized by the Entrepreneurship Foundation and Prof. Faltin (see above). 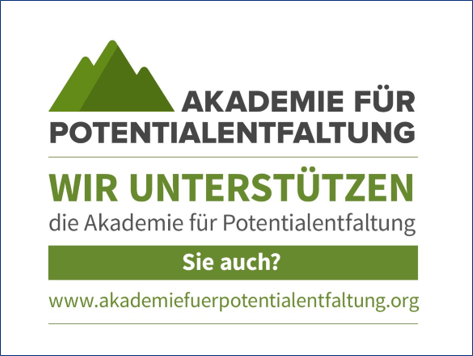 Prof. Hüther is as well founder of the “Akademie für Potentialentfaltung”. As you can see, it’s about the way and manor how the members of a community should interact with each other, to explore jointly but also individually their potentials and develop them for the benefit of the community. In many social projects, administrative community work, in sports, arts and cultural projects it has been proven, that the approach of Prof. Hüther and his academy is successful and creates results, equally amazing as unique. For the time being the academy is active in Germany, Austria and Switzerland. As soon as you take care about it more closely you will soon have own ideas to join in and to transfer the academy’s concepts into your business or private life. With the next project described here, I want to give you an example on this. If you have become curious about it, please don’t hesitate to get in touch with the academy.